↑ Csorba, G., Bates, P., Molur, S. y Srinivasulu, C. (2008). «Megaderma lyra». Lista Roja de especies amenazadas de la UICN 2012.2 (en inglés). Consultado el 18 de enero de 2013. ↑ Lekagul, B., J. McNeely. 1977. Mammals of Thailand. Bangkok: Sahakarnbharn. ↑ a b c Nowak, R. 1994. 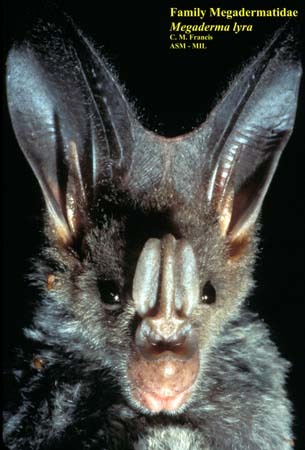 Walker's Bats of the World. Baltomore and London: The Johns Hopkins University Press. ↑ Goyman, W., D. Leippert, H. Hofer. 2000. Sexual Segregation, roosting, and social behavior in a free-ranging colony of Indian false vampires (*Megaderma lyra*).. Zeitschrift fuer Saeugetierkunde, 65 (3): 138-148. Wikispecies tiene un artículo sobre Megaderma lyra. Esta página se editó por última vez el 12 nov 2017 a las 13:32.